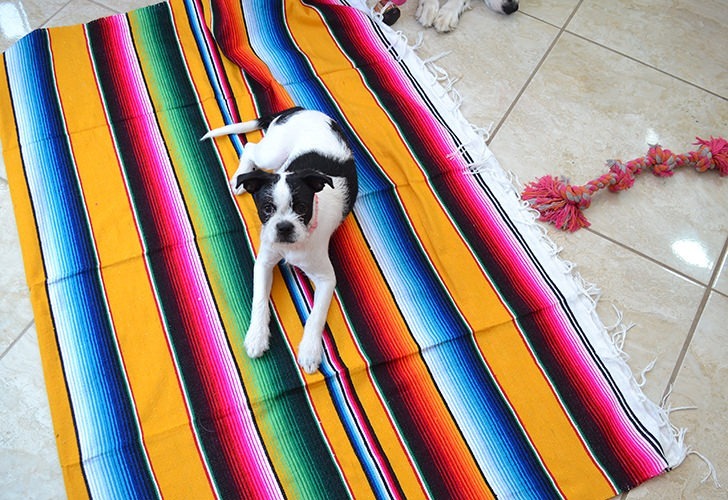 So Rob and I have kind of fallen in love with a lot of stuff about South Texas Hispanic culture. 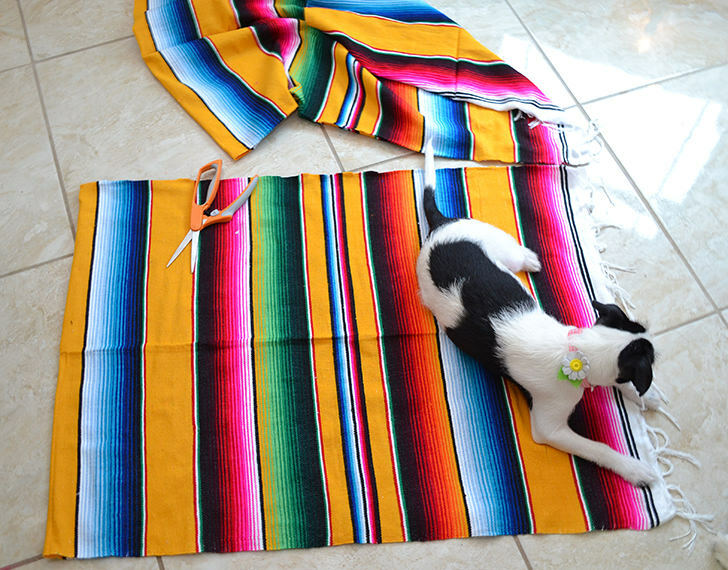 There are so many places where we can buy things from Mexico or “hecho en Mexico”. 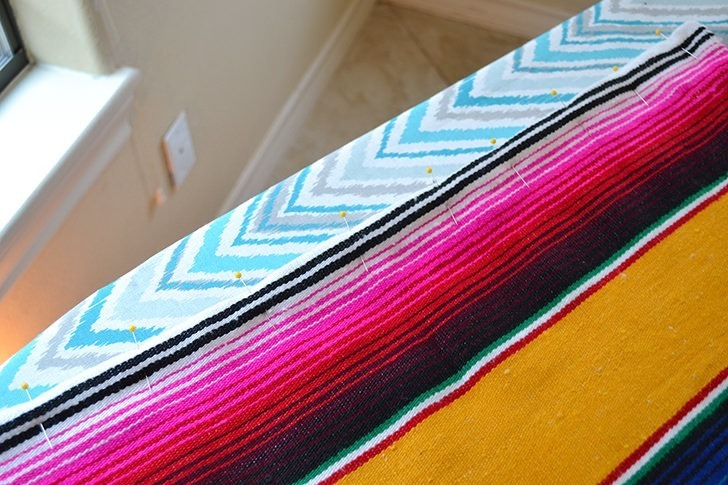 There is definitely a style with these things Mexican we keep falling in love with… lots and lots of color. 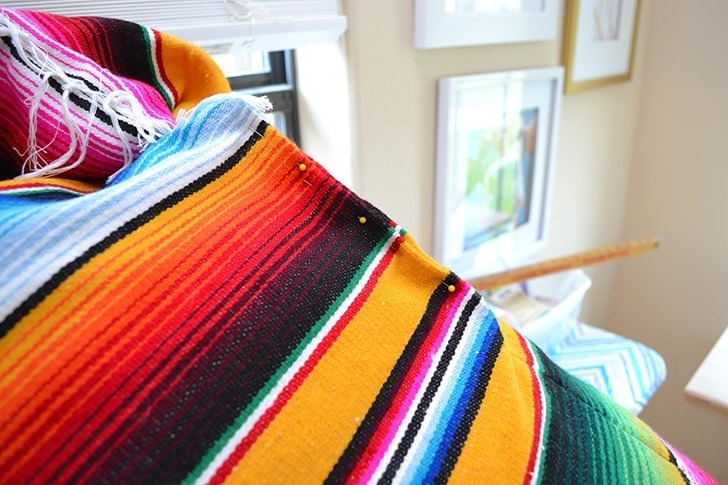 We’ve gotten blankets and pots and rugs and statues that are all bright, amazing colors and we love these things so much. 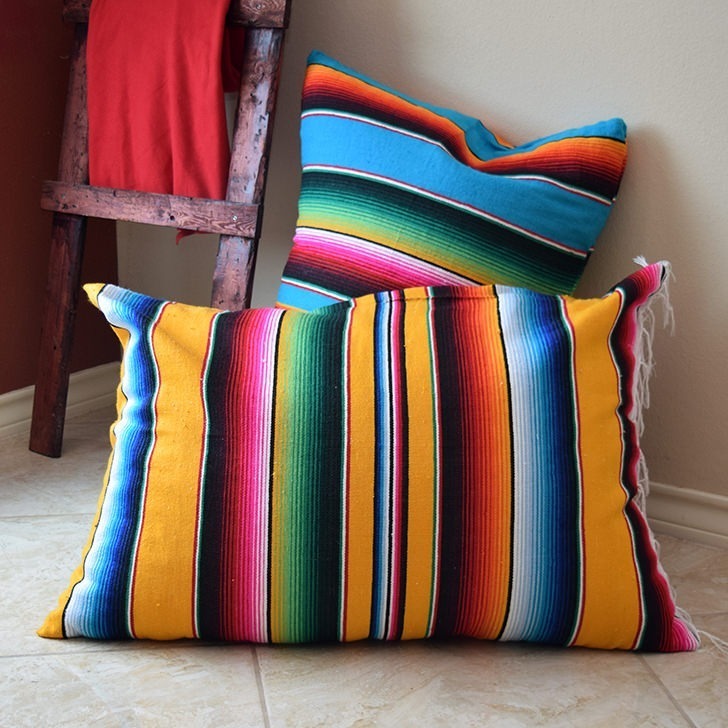 When I decided I wanted a few floor pillows like I had as a kid I naturally gravitated toward the bright colorful things we could find around town. 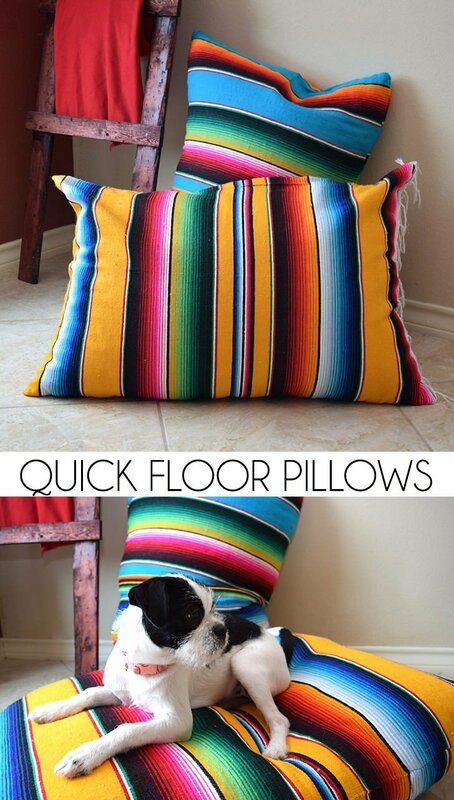 After a trip to a local store called “Little Mexico” I set about turning 2 throw blankets into 2 floor pillows. The best part? I still have half of each throw left to DIY with! My finished pillows are 2 foot by 3 foot and one took a full bag of filler while the other took all but a few handfuls and it’s a little fuller than I’d like. It’s all very weird BUT hopefully that will help to serve you in how much filler you want to get for your new floor pillows. Now these little beads are actually styrofoam and at some point they are going to compress down and not be so full. 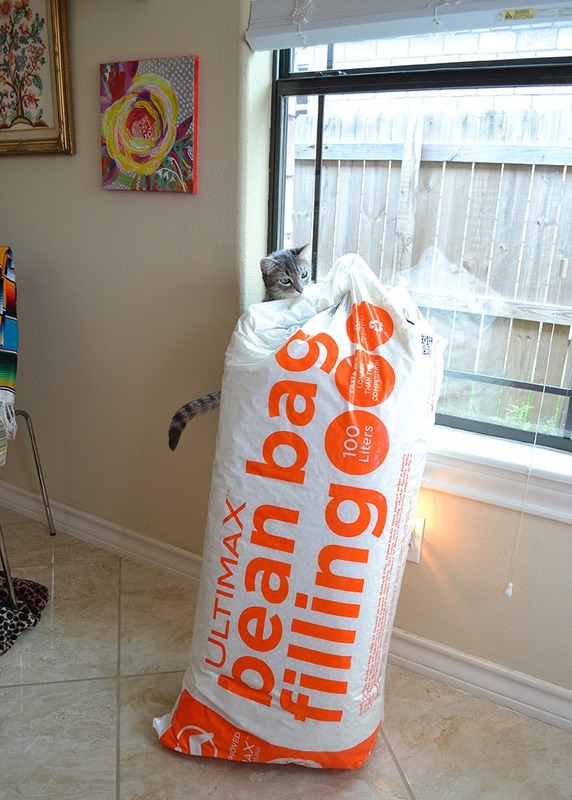 I guess that’s why they sell replacement filling for bean bags in the first place. Cut your throw in half and fold it in half. 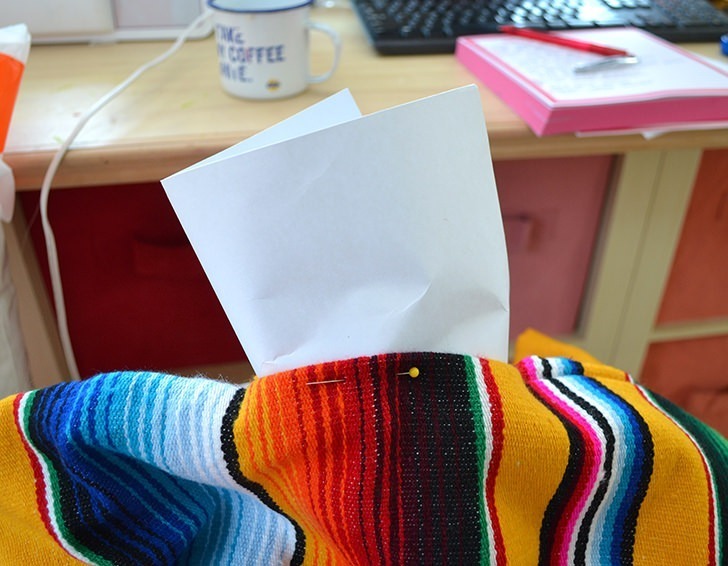 That fold will be one side of your pillow and one less side you’ll need to stitch shut. Using the appropriate heat setting on a hot iron press out any wrinkles or creases except for the big fold that will act as your first side. You can actually press that down to make the fold more permanent. 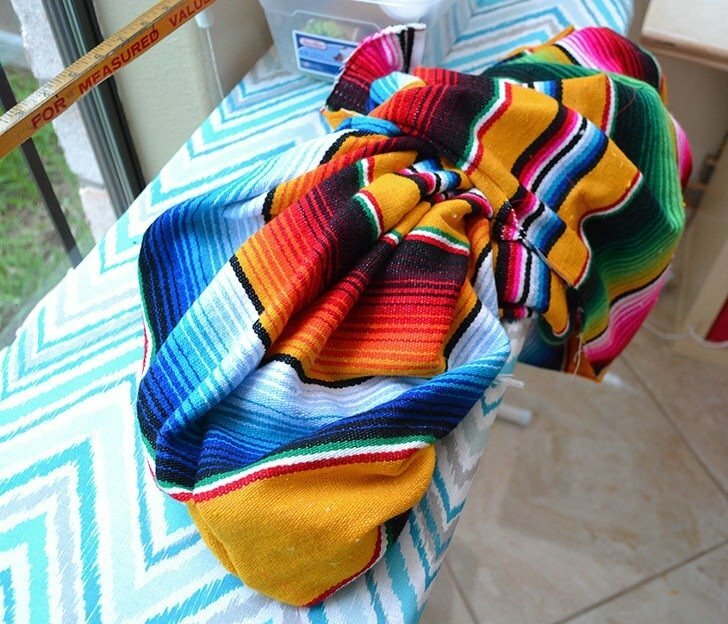 Turning your blanket with the pretty side inward use straight pins to form the shape of the pillow. 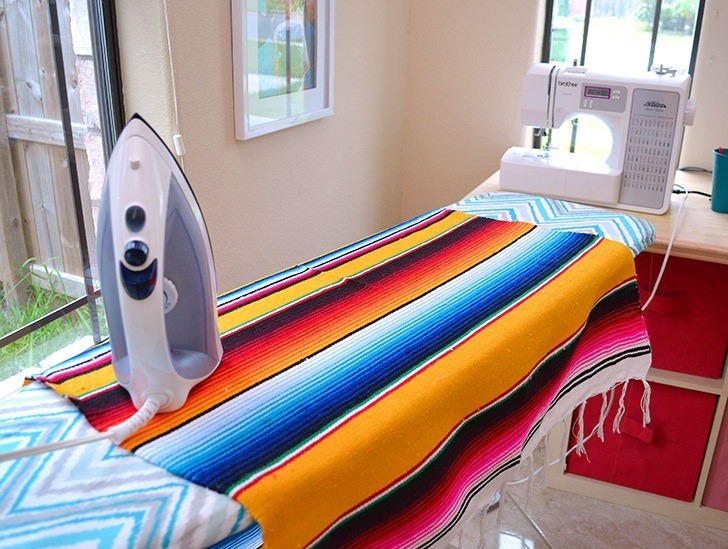 You can crease the ends with your hot iron to help make a nice, clean seam. 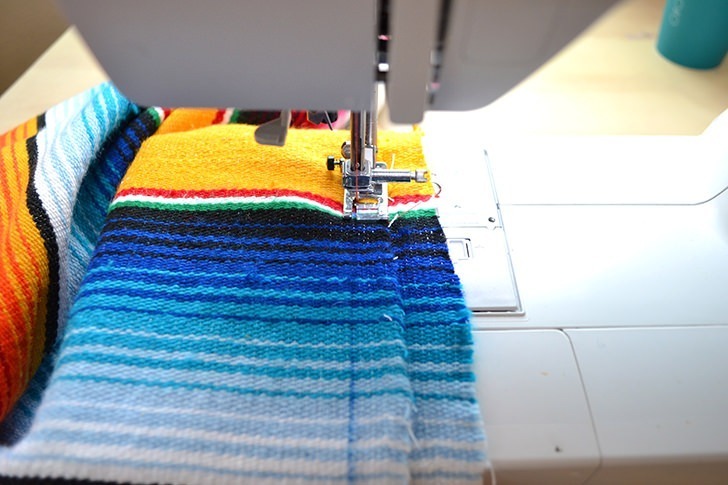 Stitch the blanket around the 3 sides to be sewn shut but leave a gap to be used to fill the pillow. 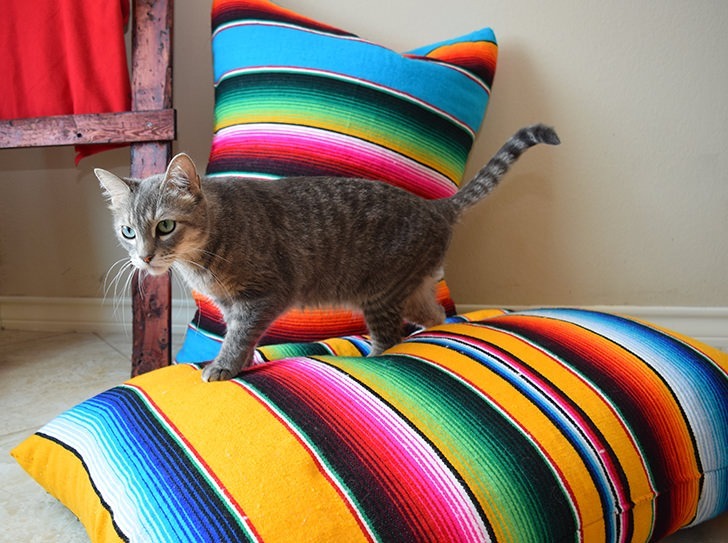 The larger the pillow the larger the gap can be. I made mine so that I could easily insert my hand to help in filling the bag with my styrofoam beads. 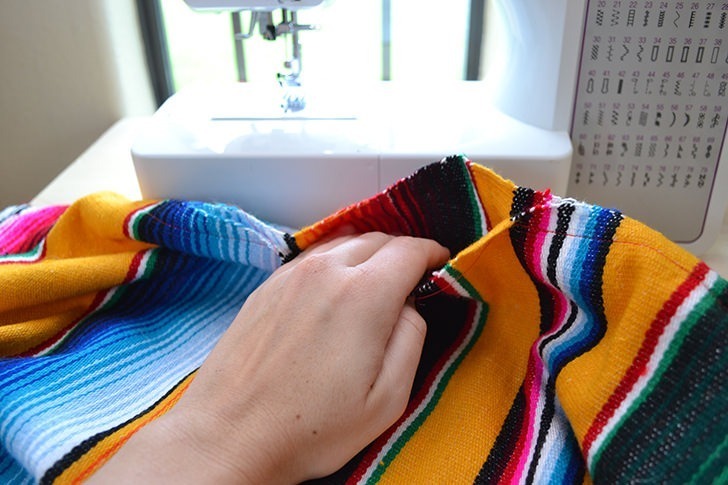 Be sure to backstitch to add extra strength to the seam at your opening. It’s super easy to accidentally stretch and tear your stitches out. Turn your pillow inside out so that you have the pretty side out and facing the world! Use your hands or a stick to poke the corners to get them as square as possible. If they refuse to come out square you can trim the extra fabric from the inside near your stitches to help. 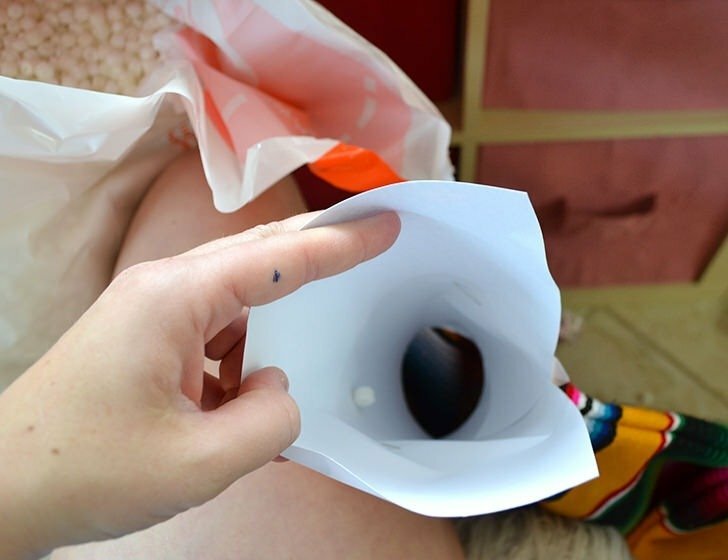 Using an old piece of heavy paper, like a piece of cardstock, form a funnel. Use pins to stick it to the opening of your pillow and keep it nice and steady. Now if you have somebody to help you I can’t stress enough that getting their help will make this so easy. As I soon learned little styrofoam balls RUN away from you. Like they pop out of the bag and go skittering across the floor. You can tell it has something to do with static electricity but I’m not smart enough to understand why. I just know that I STILL have little styrofoam balls popping up all over the house that practically run away from my broom! It’s a disaster! If you have help one can hold the funnel and the pillow case while the other pours the beads straight into the funnel. If you’re rocking this solo here’s what you’ll need to do… Find a metal something or another (once I used a mug and the next a little pail) and scoop out the styrofoam beads and pour them in through the funnel. Now plastic is a NO GO. Oh, my goodness these things will SHOOT OUT OF THE BAG and go flying across the room and they’ll stick to your hair and your pants and the Jehovah’s Witnesses will thing you’re a total weirdo. 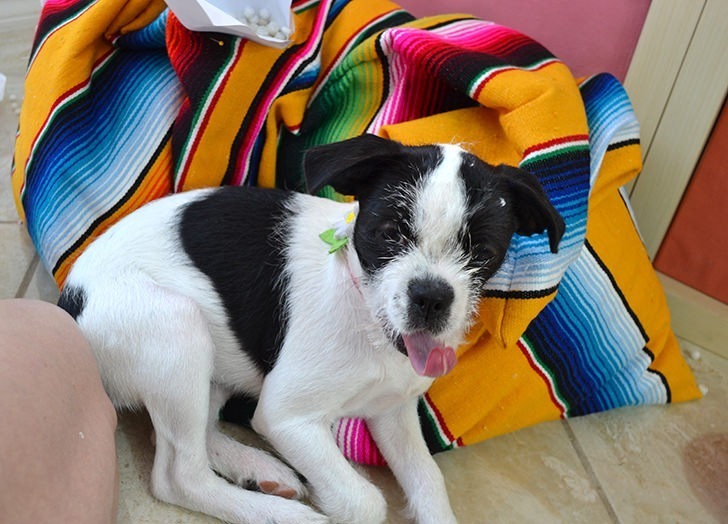 Bonus points of your puppy runs and jumps into the arms of one of your guests only to pee on her. When the bag is full to your liking use pins to close up the case keeping in line with the original seam as much as possible. Hand stitch this area to close up. 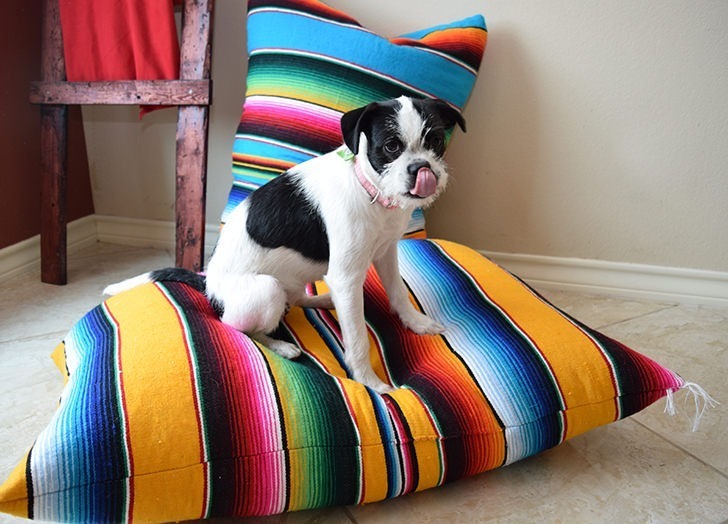 When the time comes we’ll have these amazing and fabulously colorful floor pillows we can toss down for when we want to play a game on the ground or sprawl out to watch a movie or what have you. They’re going to get so much use! I’m so excited for them! P.S. 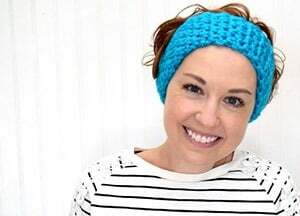 Carly is very cute in these pictures!